I pity Carolina Tuesday. NO chance of a win for them, I mean NONE. Sundin is lookin his age, which is scary. Good thing that he's only signed for the rest of the year. 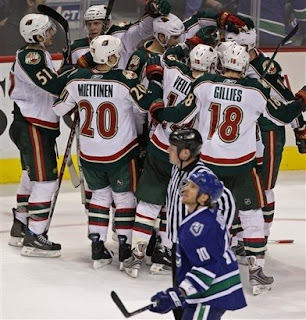 Kesler was a monster tonight, he picked up the team and carried them on his back. I loved it, and he stepped up bigtime in everyones eyes. And the point is a good point, we are still 1 point out of 8th, but there are 32 games left. Its time to relax, breath and just enjoy the fact that Van has lost 9 in a row, and yet is 1 win away from being right back in the dance. Valentines day i'm predictin Van well back into the NW race, and closin fast on Flamer country. And finally, good on you for seein the good in whats happenin. Oh yeah. I remain positive as you are. Yet realistic. I think it's going to be tough on the team over the next 2 home games. But once they head out on the road for 3 games I bet they completely turn it around. I tried to do a a 360 but landed on my spine, separating my lateral guris.